Indigenous People of Biafra (IPOB) and Movement for Actualisation of Sovereign State of Biafra (MASSOB) had declared May 30 a public holiday for their supporters to commemorate 50 years of the declaration of Biafra. They also said they wanted to remember those who died in the Nigerian civil war fought between Nigerian troops and rebel Biafra forces. “The position of MASSOB and BIM under my watch is that we are not part of any sit-at-home order, all what I am aware is the week-long celebration to mark 18th anniversary of MASSOB and 50th anniversary of Biafra. “Anybody talking about sit-at-home is on his own and I have nothing to tell anybody on such activity neither should any problem associated to it be attributed to me,’’ he said. In Umuahia, workers in federal establishments and those of the Abia Government stayed away from their offices. 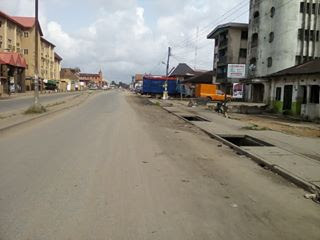 Abia State Secretariat Complex, public and private schools, markets and major supermarkets in the city were shut and transporters stayed off the roads. Umuahia city centre, known as Isi-gate, was empty and quiet, while the shops in the area and the adjoining streets were all closed. Many residents remained indoors, while children used the opportunity to play football on some streets. On the streets, detachments of police and other security agents patrolled, while a police helicopter hovered in the sky to monitor events. The Police Public Relations Officer in Abia, Mr Geoffrey Ogbonna, told NAN by telephone that there was no threat to public peace. He said that security operatives were adequately deployed in all parts of the state to checkmate any possible breach of the peace. Ogbonna said that the Commissioner of Police, Mr Leye Oyebade, was leading a combined team of all-security agencies to maintain the peace. “The commissioner has been leading the heads of other security agencies in the state to ensure that there is no breakdown of law and order. “Abia is calm and people are going about their lawful businesses without any fear of molestation,” Ogbonna said. 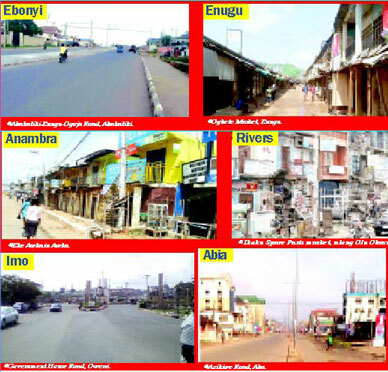 In Owerri, two major markets, Eke Onuwa and Relief Markets, remained closed, likewise shops on some major streets, Wetheral Road and Mbaise Road. The busy Douglas Road, which usually bustles with heavy traffic, was free as traders stayed home. Banks, eateries and boutiques also closed business activities. A bank worker, who pleaded anonymity, said the workers were awaiting further directives from their headquarters before they could open for business. There were few commercial vehicles on the road, while Imo Transport Company shut operations. Some passengers who arrived at motor-parks early to leave the city were stranded. Mrs Oluchi Uchenwa said she arrive in Owerri at 7a.m. to travel to Port Harcourt but could not get a vehicle. Students also failed to turn up in school in spite of their teachers coming to work. The situation also affected activities at the courts with some sitting and others not working.